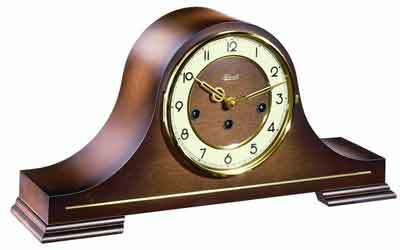 Hermle 21092-030340 Stepney Mid-century design Tambour style key wound mantel clock in a rich walnut finish made in Germany. The walnut case is "highlighted" from darker edges to a lighter stain toward the center. An inlaid solid brass rod runs from let to right below the dial found in other mid century modern selections. Easy to read "retro-style" numerals are applied to an ivory ring on the dial for easy viewing. The hands are retro period styled behind a hinged brass bezel with convex glass lens. 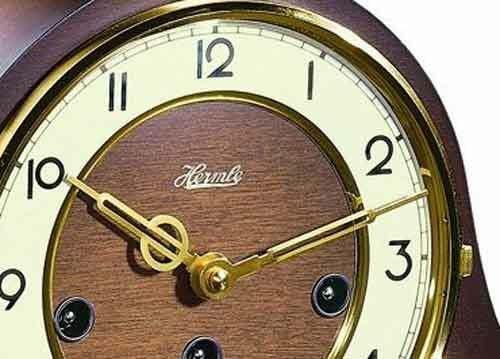 The center of the dial is done in genuine walnut. This is the most authentic mid-century modern clock available. 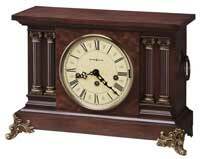 This mantel clock features a German made, mechanical Quarter hour Westminster chime movement wound once a week and a silencing lever for the chime on demand. 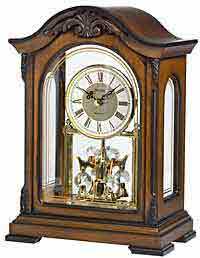 Height: 8 1/2", Width 17", Depth: 4¼"
Clocks for sale at The Clock Depot including the 21092-030340 at discount prices.